I have some good memories of playing single player FreQuency years ago. However, the only memories I have of the multiplayer mode are of me playing against my friends in high school and crushing them, then going off to college and playing against a guy in my dorm and being crushed. Neither situation was particularly fun. With Harmonix's new Kickstarter-funded Amplitude, the multiplayer is getting a nice upgrade. Instead of FreQuency's simple head-to-head score attack, it uses something closer to the system found in Amplitude (2003). From that starting point, the player count has increased from two to four, and a handful of other tweaks have been implemented, turning it into a party game I can imagine a group switching to after arms and voices are shot from playing too much Rock Band. At its core, the multiplayer mode plays the same as the single player. Different tracks are set up, each representing a piece of instrumentation used to build a song. Gems are arranged on the tracks, and it's up to the players to hit the right buttons with the beats to collect the gems. Standard rhythm game fare. In multiplayer, everybody is sharing the same set of tracks, but only one person can score from a given track at one time. Whichever player has been on a track the longest is at the front of the line; those behind have to switch to a different track to collect gems. One of the great things about Amplitude is that it encourages a sort of zen state, where the player is not only focusing on the track at hand, but also dedicating some almost subconscious processing power to the periphery. Not only does a high-level player watch the track currently being played, but also the next track to jump to. Additional players and another layer to this. 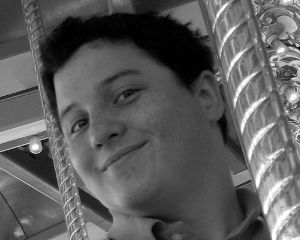 Now it's necessary to keep tabs on other players, predicting their movements and reacting accordingly. There are other ways to interfere with opponents. While a track is usually first come, first served, certain powerups can tip the balance. One allows the player to jump to the front of a track, essentially stealing it from another player. In my play time at PAX East, I was able to hop in behind another player, deploy a series staple Autocatcher to delete his track and claim it for my own, then zip off before he realized what had happened. Classic. Harmonix's Annette Gonzales also described a cooperative mode, though I didn't get a chance to try it out. It came from experiences similar to my own with the older titles. When there is a significant skill gap between players, competitive modes aren't really fun for anybody. Like Rock Band, Amplitude can be a place where people come together to (re)create music, not just to see who can press buttons better. 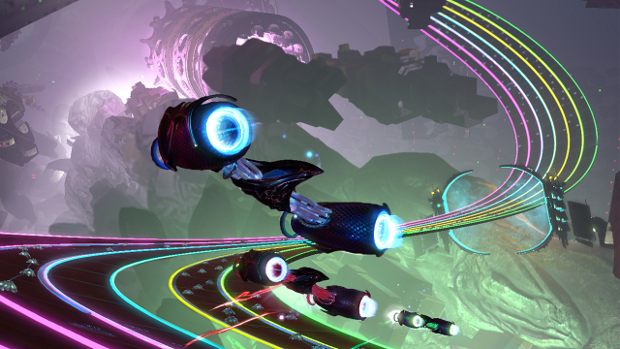 Amplitude is expected to release for PlayStation consoles this summer.